Dandelion Hideaway offer the finest in farm glamping holidays. Whether looking for a wonderfully unique holiday experience or a romantic escape, the Dandelion Hideaway’s collection of beautiful nostalgic canvas cottages melt into the glorious Leicestershire countryside. They offer a handful of gorgeous self-catering accommodation nestled within two hundred acres of rolling countryside, close to The National Forest. 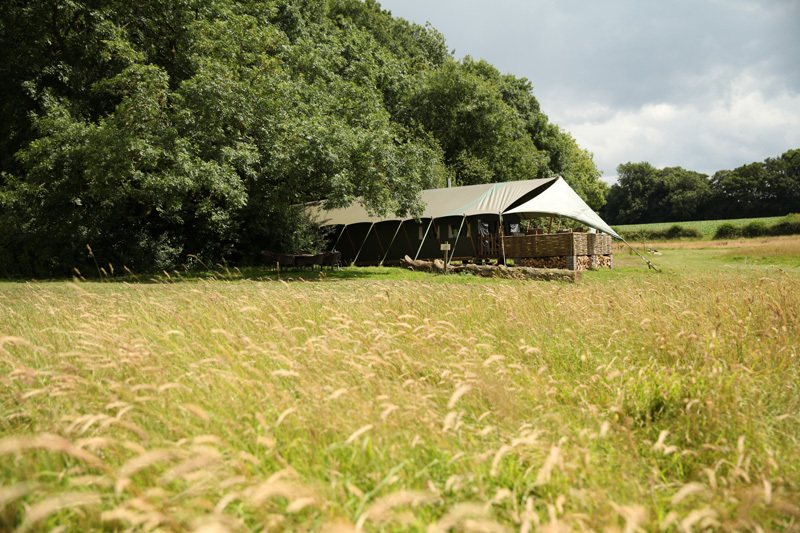 They are the only glamping destination to have won the prestigious VisitEngland Excellence Award in the self-catering accommodation category in 2014, 2015 and 2016. We were approached by Sharon, the owner when she was speaking at the Farm Innovation Show in November. 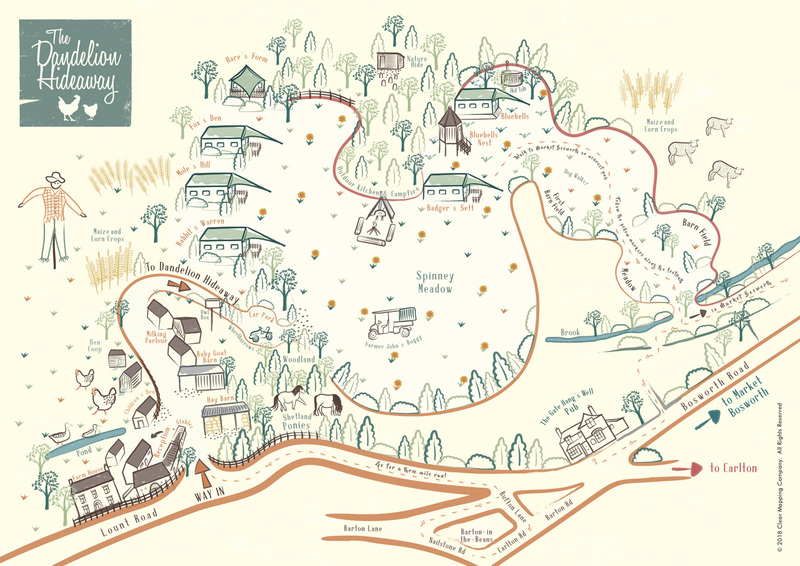 She wanted us to create a bespoke illustrated map to fit with her brand, showcasing the Dandelion Hideaway accommodation and the local walks in the stunning surrounding countryside. 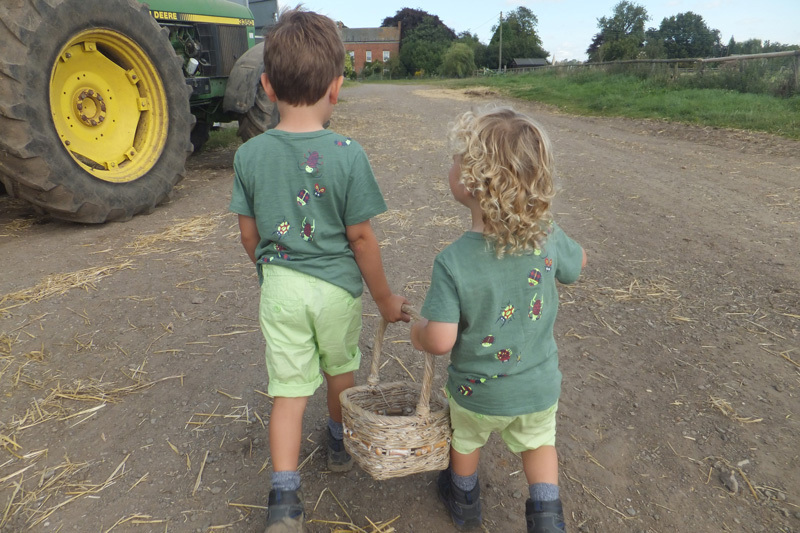 Caroline went to meet Sharon on her working farm, to discuss her ideas for the development of the Dandelion Hideaway for the 2018 season. Sharon also took took the opportunity to explain why her business attracts guests year after year – these aspects would then be emphasised in the map. Sharon’s husband John who farms the land took Caroline on a guided tour of the farm in the infamous ‘Farmer John’s buggy’. With information about the site and farm gathered Caroline was able to add the detail whilst with Sharon and John and discuss the extent of their map. Sharon and John were keen to highlight a three mile run and the walking route to get to the nearest pub. Whilst on site Caroline was able to sketch a draft map in front of the client, showing the different ways the information could be explained. We worked extremely closely with Sharon to ensure that the illustrative style was exactly as Sharon envisaged. Our clients are always central to the design process; feedback at regular intervals is crucial to ensure we are both working towards the desired end result. 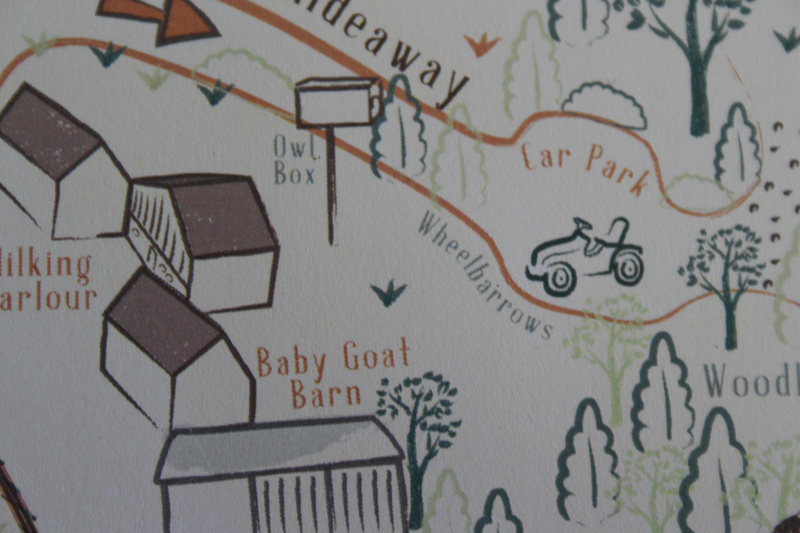 Sharon was absolutely thrilled with the map and is looking forward to sharing it with guests, where it will be placed in the welcome pack, put onto the Dandelion Hideaway website and placed on the new site noticeboard. By providing the final artwork in several formats it allows our clients to have the flexibility to use the maps right away for various purposes. From the moment I met Caroline many years ago at a trade show I knew I would ask her to draw our farm…such skill and creativity and beautiful pieces of work. I’m delighted with my map and wish I’d had it produced years ago! Many, many uses from postcards, to welcome cards…lovely branding for us.